Miss Lady Lace is a pinup model, burlesque artist, and vintage blogger with a strong presence through social media, in the industry, and within the community. With over 100,00 views on her website, and combining her followers on Facebook, Instagram and YouTube she has over 16,000 followers. With her passion for all things vintage she can help share and connect your business with clients who’d love your brand. If you’re a company with products, Lady Lace is more than happy to give them an honest review of your products. Working as a professional model, Lady Lace is also more than happy to have a photo shoot in the items given for review, as well as posting up the actual review. 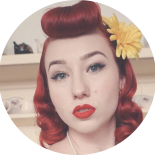 Lady Lace has been reviewing products for many large pinup brands across the nation and from all across the world, with a strong passion for authentic pinup styles, and supporting local businesses. Hosting many regular classes and workshops, she can also distribute your business cards, and vouchers to her fabulous students too.